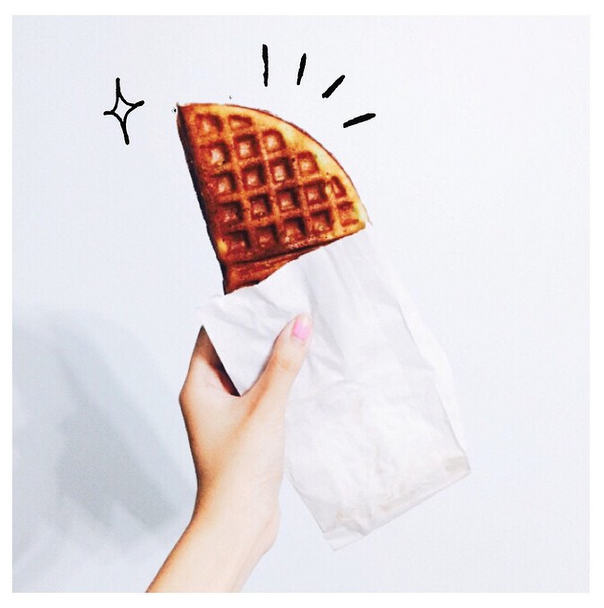 If you followed me on my instagram account, you would know that I'm a huge waffle fan regardless whether it is those from the cafes or the ones from the normal bakery shops with peanut butter or kaya. I guess the amount of waffles I've eaten is at least 5kg of my weight LOL. 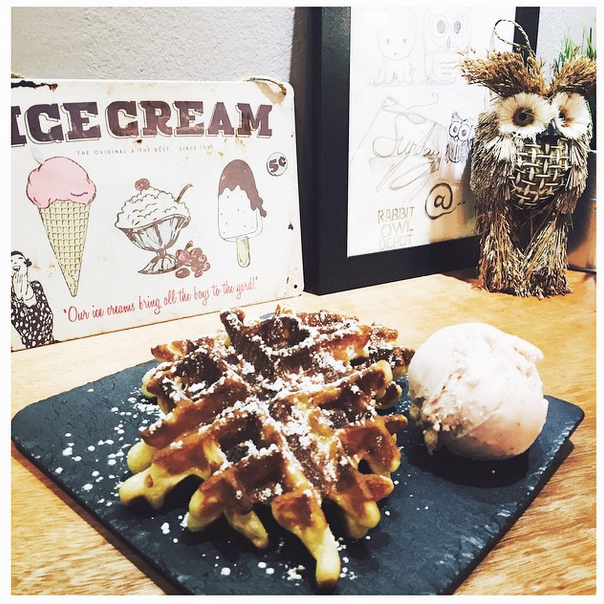 So in today's blogpost, I will be sharing with you guys the best waffle place in Singapore (based on my own opinion). 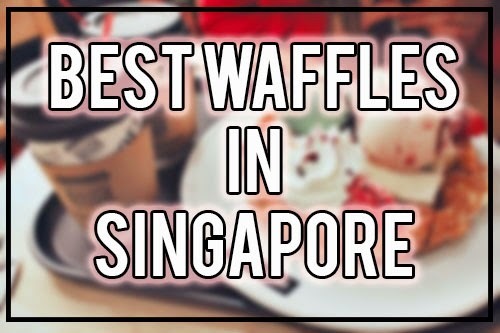 Note that waffles are not ranked below, just a general waffle guide! Starting off with the normal type of waffles, I think only Mirana Cake house has the best one - It's crispy on the outside and soft on the inside and when the peanut butter melts in it it's like OMGGGGGGG. I have tried many normal waffles from other bakery shops but usually they came out soggy and soft which is a total turn off la. They have outlets at Raffles place but I'm not sure if the waffles is as good as the simei one. Now to the real deal: Waffles from cafes. I prefer the sweet type of waffles compared to the savoury ones so I will only be doing a review on sweet waffles. 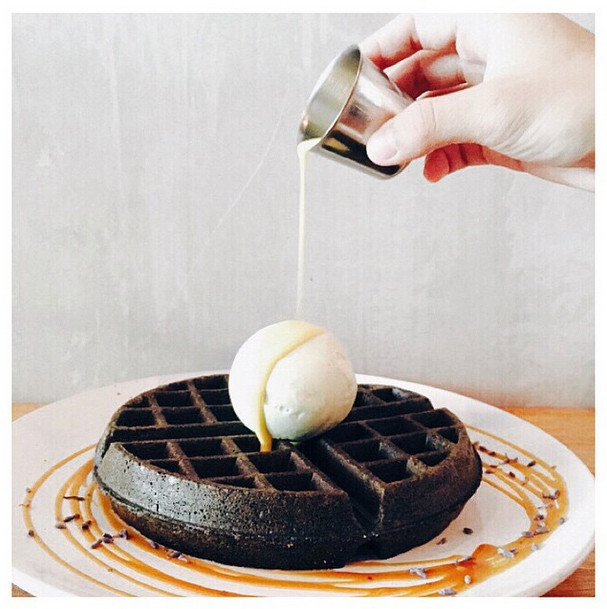 Charcoal waffle with salted egg drizzle and a scoop of thai green tea ice cream. 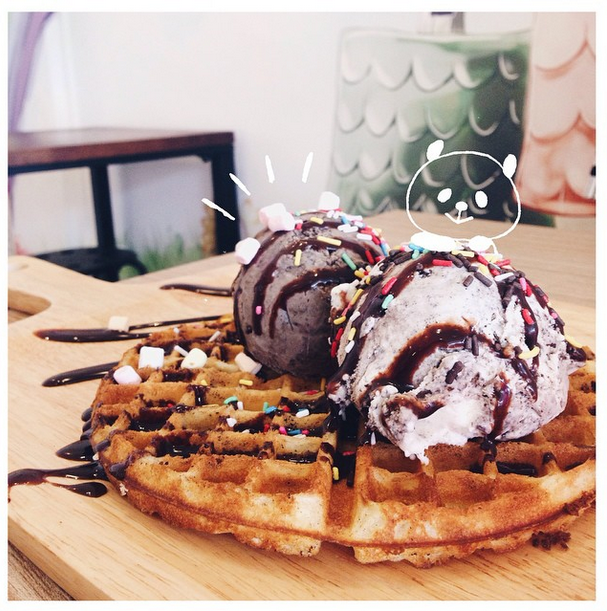 This is a really unique ice cream cafe that serves exquisite flavors of ice cream (& waffles). The combination of charcoal flavour and salted egg drizzle may sounds weird but they came up to a pretty amazing taste. The sweetness is not too overwhelming, perfect for those that doesn't like sweet stuff but fancy a little treat. Not only do they have ice cream, they also have plated desserts but at a slightly pricey end. Ice Cream are available in Standard at $3.90 and Premium $4.50 per scoop. This is one that many raved about. It was so crazy that even when the shop isn't opened yet, there were actually people queuing outside already. Sunday Folks is opened up by the same bunch of people from Creamier (see below). The only difference is that instead of the normal gelato ice cream, it's soft serve ice cream this time round. 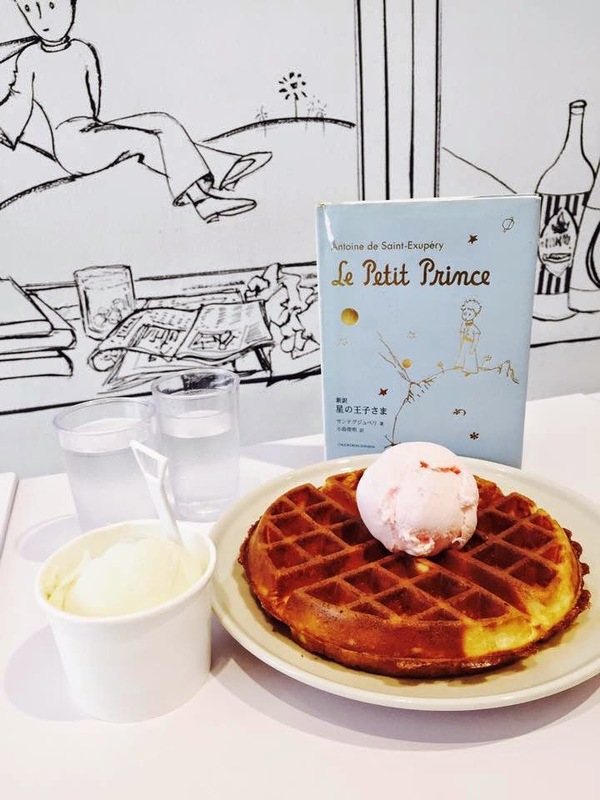 The waffles are crispy enough to my liking but the ice cream tends to melt faster because they are soft serve ice cream but I don't really have trouble with that because I'm generally a fast eater. You may end up with a huge plate of mess like my sister. Ice cream flavors are limited but unique like sea salt gula maka, Earl Grey lavender and Roasted pistachio and basics like dark chocolate, summer berries and vanilla. Single waffles @ $8.80 with soft serve ice cream. 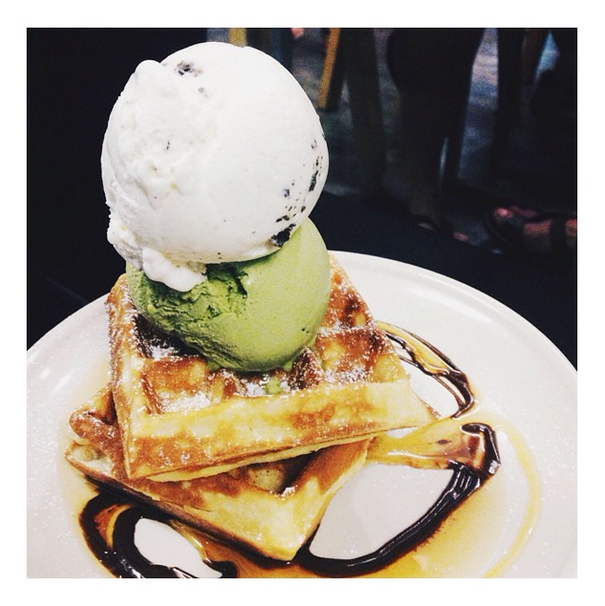 Double waffles @ $11.80 with soft serve ice cream. As mentioned above, it's the same bunch of people from Sunday Folks so the waffles very much tasted the same. The crowd is also extremely scary. So scary that they allowed people to take the plates to the playground outside their shop and dine there. I had to sit on the floor outside of the shop and put my plate on the bench to eat my waffles lol so please avoid visiting during the peak hours. 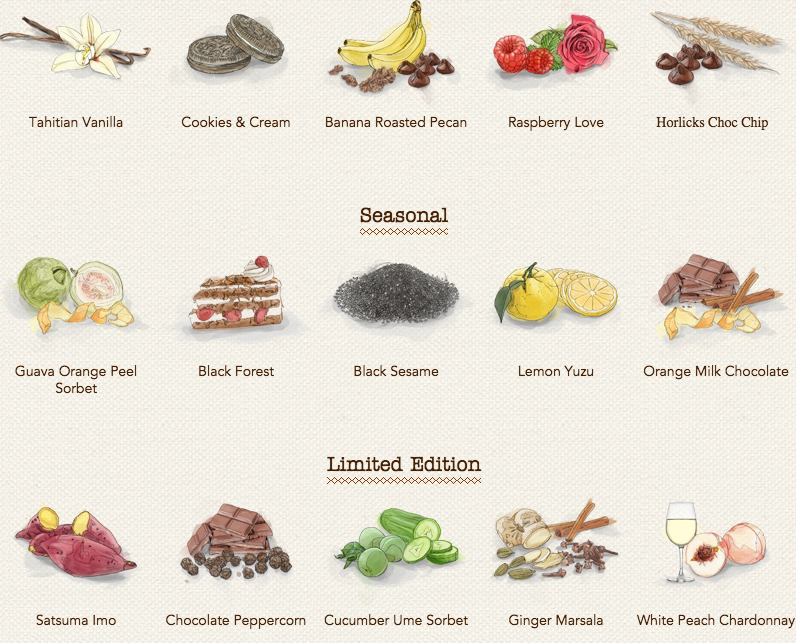 Here are just some of them, hop on to their website for more flavors. Probably due to the location, the cafe was practically empty which I love cox you wouldn't have to wait so long for your waffles and when you take lots of shots of your food you wouldn't get judged HAHAHA ok back to topic. There are two type of waffles for you to choose from: The softer version and the crispy version. We picked the crispy version and I really loved it! It's unlike the kind of waffles you get at the usual cafes which I find it rather unique. They have quite a huge range of ice cream selection too. I've forgotten about the price but it's definitely not pricey for sure for the amount you get!! What's so unique about the waffles is that they come in snowflakes shape! Waffles is crispy but I it a little too expensive for the portion given. Oh, the handcrafted gelato here only contain 8% of fat... SO EAT ALL YOU CAN GUYS. And that's I've for you guys in this post! 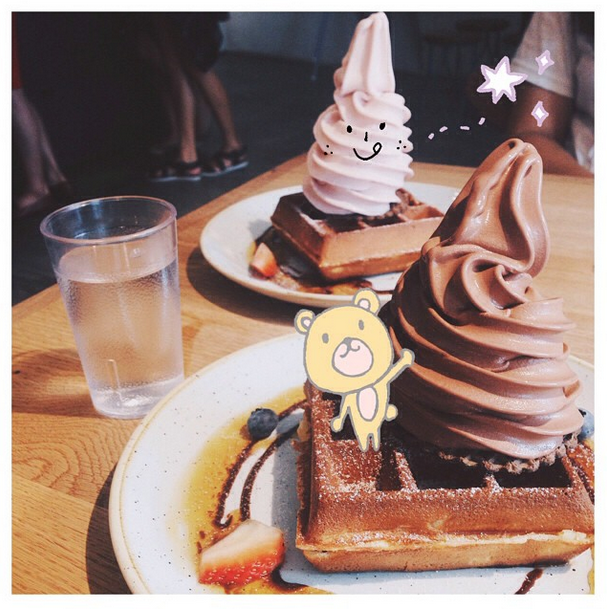 Tell me your favourite waffle place by leaving a comment, I would love to try it out!